Eye, Eye… Up in the Sky! It was a long day today – Good Friday service at church, visit to a friend’s house who lost her dear mother this morning and the scorching sun that goes without saying. We were driving back home which is quite a distance from Secunderabad. KT was completely exhausted and fast asleep. On the way, TH parked the car in front of a grocery store to buy something. 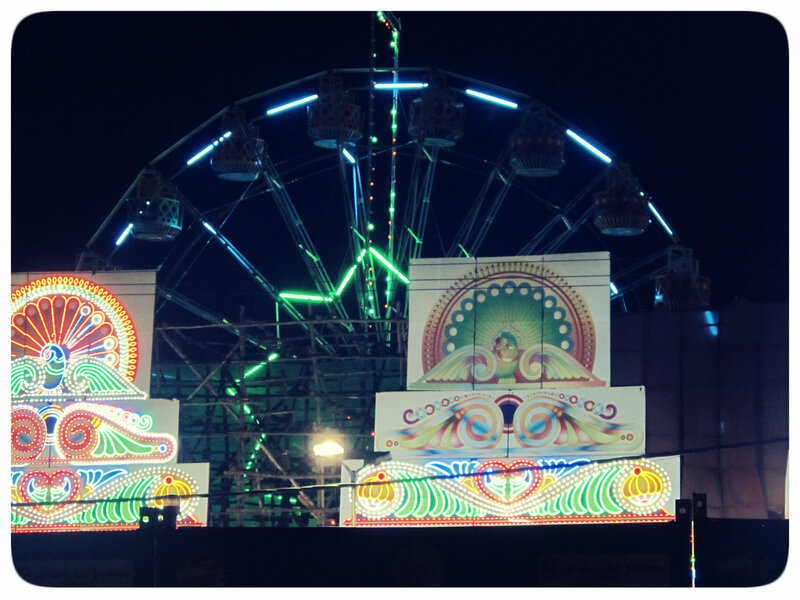 Right opposite to where he had parked was a carnival – color lights, giant wheel et all! I was enjoying the quiet moment reading my favorite blogs. All of sudden, KT woke up from her sleep, wide eyed, pointing towards the carnival she kept repeating, “Mamma, eye, eye, London Eye up in the sky!” I turn and see – there’s this giant wheel! Our visit to London last year has been more than a memorable one for me. Little did I know that a place could capture my heart to such an extent. I would often want to tell KT about the good times we had there, but restricted myself thinking she may not remember anything. Today she proved me wrong for the second time! It is simply amazing how much a child can remember and recollect. The way their young brains can relate an object or a thing with something from the past is again incredible!